Road to Singapore is a series on the city I’ve lived in since 1997. 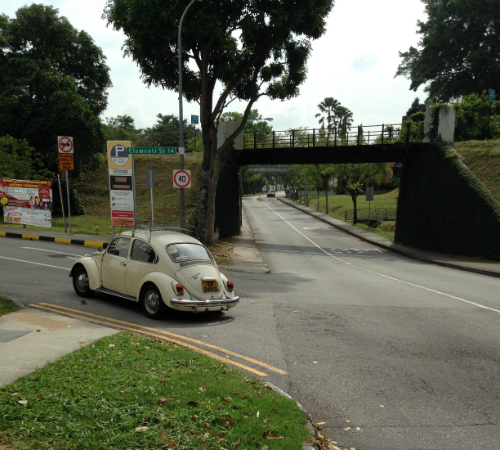 Sometime in 2015, as Singapore got ready to celebrate SG50 or fifty years of being an independent, sovereign nation, I started ambling through its districts, towns, and wilderness with my walking partner AJ. The idea was to see as much of this small yet vibrant place, get to know Singapore more intimately, a city that rarely fails to astonish me. “Losing Track” is a part of the series. Irrelevance. As I thought of the unused train track this morning, that’s the word that finally floated up and seemed to have meaning. 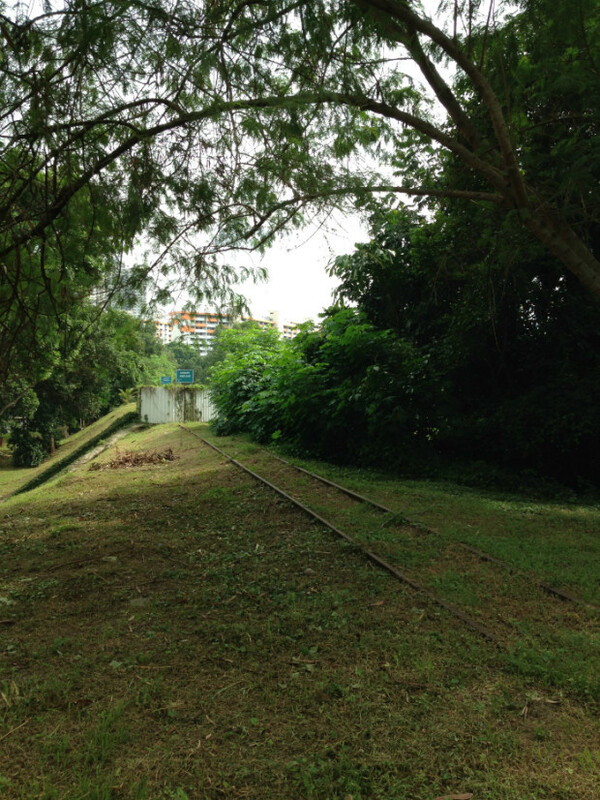 I’d been thinking for some time of our walk on Saturday, we’d decided to go to Clementi toward the west and explore. 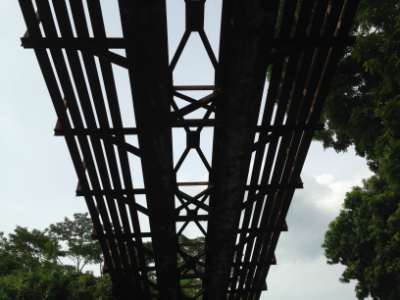 When I searched Clementi on the net it took me straight to something I’d not heard of before… steel truss bridge. The pictures showed an abandoned old rusty bridge made of angular metal structures that reminded me of the majestic Howrah Bridge in Calcutta. Those odd looking pieces form trusses I found out later and they were often used to make bridges. But when you’re just an old and forgotten train track you needn’t bother with all this trivia, nothing tawdry touches you. Grass grows all around and shelters you, birds and flowers drop in, leaves float down and sit on your wooden sleepers, no one knows you’re there and if they perchance find out, no one can use you… no one. You just lie there, irrelevant. Yet, perhaps happy. Listening to the rooster crowing in the stolen kampong-ish farm on one side, or the laughter of kids playing in the Housing Development Board’s brightly coloured park just in front, or the soft rustle of the languid Sungei Ulu Pandan over which you stretch on that bridge, and by which you lie after reaching Clementi having started further west somewhere in Jurong. 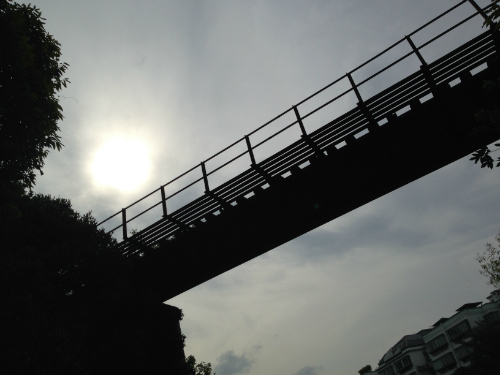 You are part of the Jurong Line, born in the mid sixties, the same age as Singapore; infrastructure is what you were called, commerce is what you spelt, and hard hard work, connecting product to buyer, reality to dream… but times change and suddenly you are no longer in the fray. There you rest, drawing me into a sense of calm, of beauty intangible and certain. 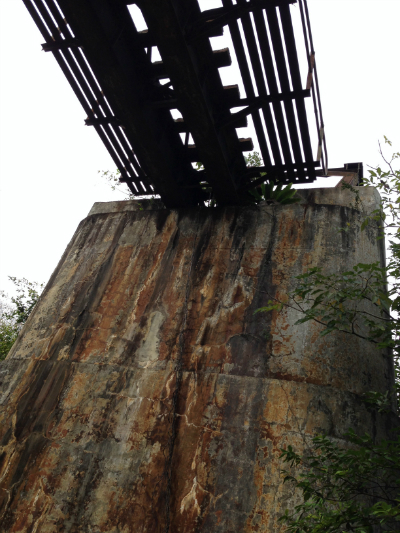 That day we walked up Sunset Way, at the underpass where the tracks cross overhead, we went off the road and trudged up the grassy slope where the hidden railway line lay between tall trees; the part which ran over Sunset Way have been boarded, no entry. 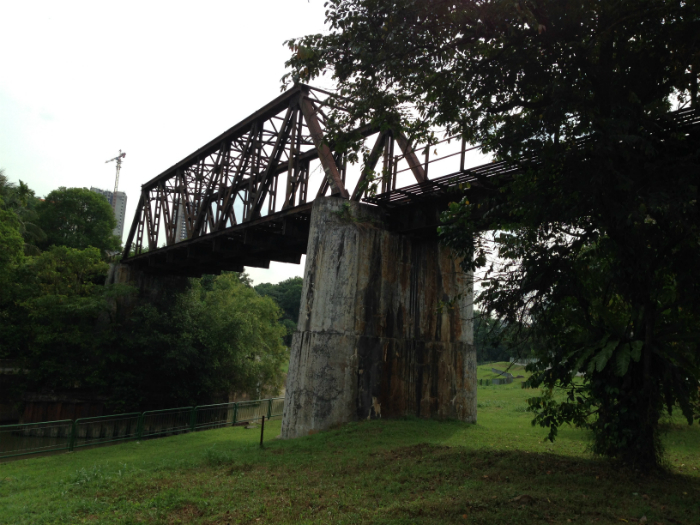 We trundled down and when we spotted the steel truss bridge, we ran in its direction. Till i stopped, fearing everything, from snakes to scorpions to the tiny little slopes that I couldn’t conquer. AJ went ahead and took some shots, no entry there too. 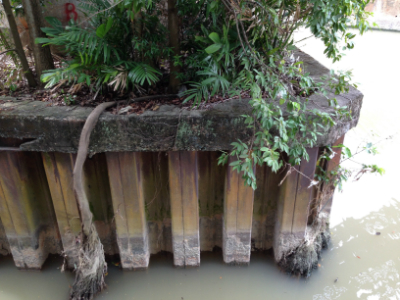 We walked around the bridge after that, just gauging the way and came upon the river, Sungei being Malay for river. On either side stood tall impersonal looking HDB blocks, a neat cycling path ran in between where trees grew high and a couple of old men fished. We admired the bridge from there, the thick pillars on either side, the bases, then a left turn up some steps and what was that? 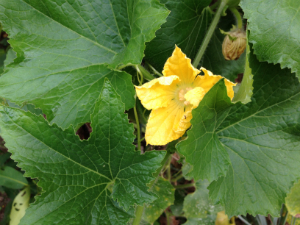 Veggie patches. Here? 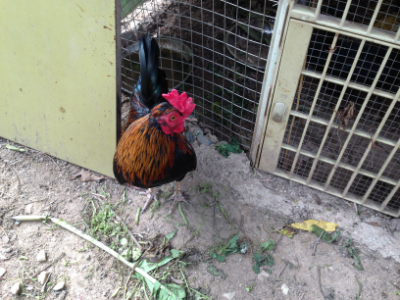 A rooster called. We’d come to a community farm, the little signpost said. 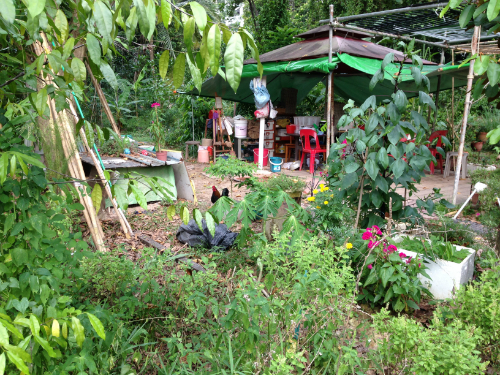 A most charming place, plenty of vegetables growing everywhere, ordinary folk lost in their brinjals, kangkong and sweet potato leaves, an easy hang loose air. You’d never ever imagine such a thing could exist in that particular, highly concretized spot. This morning I read, the government upon discovering these transgressing farmers had threatened to close the farms along that stretch, till petitions were made and the authorities relented, the MP of the area in fact had inaugurated the Clementi Avenue 4 Community Farm. And it grew green and colourful and not so precise behind neat rows of HDB towers. Met a young girl there who said she gardened only on weekends since on other days she had school. The sense of freedom and realness of that not too large plot is difficult to explain, even the air around felt different, it affected you. AJ shouted, see what he’d found right behind… it was that railway track we’d started out with… there it slanted away before me… going nowhere. 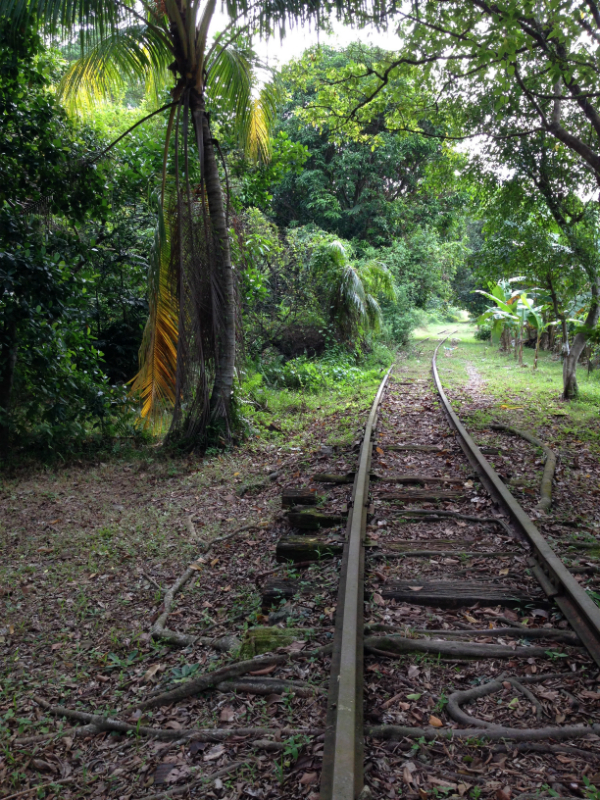 The jurong railway line was owned jointly by Keratapi Tanah Melayu, the Malaysian Railway operator and JTC, Singapore’s primary industrial developer. 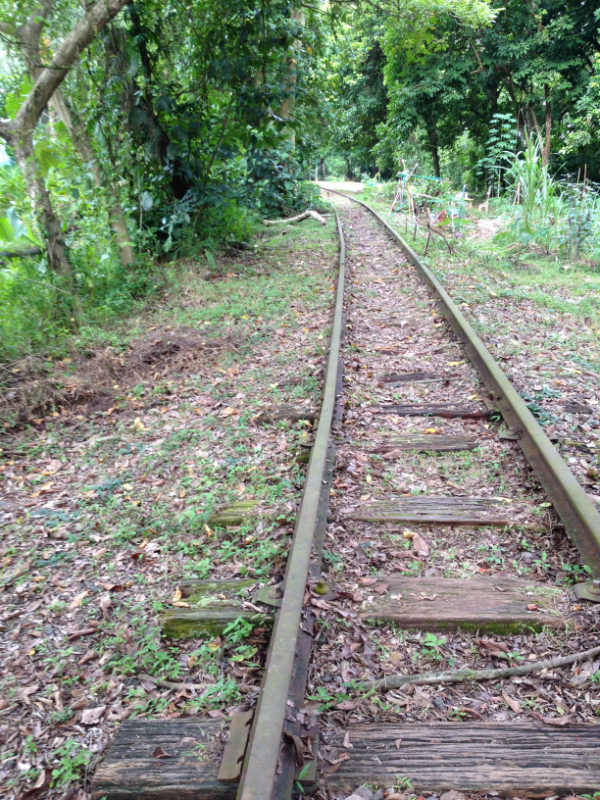 It operated between 1965 and the mid nineties and was an extension connecting Bukit Timah station to Jurong Port via Teban Gardens; It was designed to carry freight not passengers.